A phenomenon like Harry Potter does not come along very often. The young wizard and his eager companions Hermione Granger and Ron Weasley have inspired countless children to delve into reading with a fervor rarely seen, and we have J. K. Rowling to thank for that! Rowling has created a fantastic world of wizards and muggles, ghosts and trolls, and good and evil that has completely revitalized a love of reading in both kids and adults all over the world. As the often told story goes, J. K. Rowling was on the brink of poverty, receiving welfare when her first Harry Potter book catapulted her into a stratosphere of stardom rarely enjoyed by any writer. While accounts of Rowling's destitution have been greatly exaggerated, her story is still something of a rags-to-riches tale not unlike that of her most famous creation. Yes, Rowling did briefly receive government assistance after returning to her home country of England following a stint in Portugal, but that ended when she took a fairly well-paying teaching job. 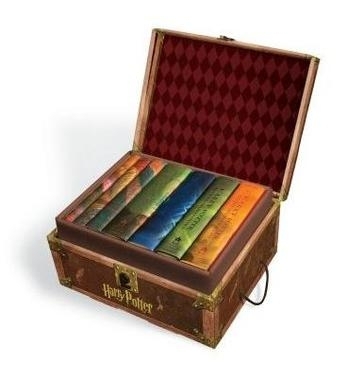 Rather than financial hardships, the period between a 1990 train ride from Manchester to London -- during which Rowling first conceived of a "scrawny, black-haired, bespectacled boy who didn't know he was a wizard" -- and the publication of Harry Potter and the Philosopher's Stone was marked by setbacks of a more personal nature. Her mother passed away. She divorced her first husband, leaving her to raise her daughter alone. The writing career she'd always desired was becoming less and less viable as her personal responsibilities mounted. Then came Harry, the bespectacled boy wizard she'd first dreamed on that fateful train ride. The success of the first Harry Potter novel (given the slightly less lofty title of Harry Potter and the Sorcerer's Stone in the U.S.), in which the orphaned, seemingly ordinary boy discovers that he is not only a possessor of incredible powers but already a celebrity among fellow wizards, was far beyond anything Joanne Kathleen Rowling ever dared imagine. International praise poured in. So did the awards. Rowling won England's National Book Award and the Smarties Prize for children's literature. The series spawned an equally successful and hotly anticipated series of films starring the young megastars Daniel Radcliffe and Emma Watson and featuring such venerable British actors as Maggie Smith, John Hurt, John Cleese, and Alan Rickman. Rowling is responsible for introducing several new words and terms into the English lexicon, such as "muggle" (a civilian lacking in wizardly powers) and "Quidditch" (a fast-paced sport played while riding broomsticks). Perhaps most satisfying of all for the mother and teacher was the way she single-handedly ignited the literary pursuits of children all over the globe. Kids everywhere couldn't wait to get their hands on Harry's latest adventure at Hogwarts School of Witchcraft and Wizardry, which is no small feat, considering that the novels tend to be exceptionally lengthy for books aimed at such a young audience (Harry Potter and the Order of the Phoenix is just a few pages shy of a whopping 900 pages!). Rowling has said that she conceives of her novels as "real literature," despite the fact that they are written for young people. Perhaps a testament to the literary merit of her books is the fact that they are nearly as popular with teenagers, college kids, and adults as they are with the grammar-school set. With the massive popularity of her Harry Potter novels, Rowling has achieved similar fame and fortune -- for better and for worse. According to an article in a 2004 edition of Forbes magazine, Rowling's wealth was estimated at 576 million English pounds. In U.S. currency, that made her the very first billionaire author. The downside of that success is the unwanted attention she receives from Britain's notoriously relentless paparazzi. As Rowling lamented to Jeremy Paxton of the BBC, "You know, I didn't think they'd rake through my bins, I didn't expect to be photographed on the beach through long lenses." Rowling has also come under fire from Christian groups who object to her depiction of wizardry and witchcraft and certain critics who contest the "literary merit" of her work. Of course, one must always keep in mind that no one ever achieves Rowling's level of celebrity without having to listen to the griping of naysayers, none of which has impeded her continued success seriously. Although Rowling could surely sell countless copies of Harry Potter books for as long as she is able to put pen to paper (and she does write much of her work in longhand), she initially conceived of the series in seven installments and has, of course, realized that plan with the publication of Harry Potter and the Deathly Hallows. "There will be no Harry Potter's midlife crisis or Harry Potter as an old wizard," she once told the Sunday Telegraph. As for what life after Harry Potter might entail for Rowling, she has suggested quite a number of possibilities, including ideas for adult novels and possible tie-ins to the Hogwarts universe involving periphery characters. Whatever Rowling chooses to do, she has forever guaranteed herself a place alongside Roald Dahl, Lewis Carroll, and L. Frank Baum as one of the most beloved children's authors of all time.